Vaping is marketed as a healthier alternative to tobacco because it doesn’t contain tobacco tar and, therefore, shouldn’t cause lung cancer. That may be true, but is dangerously simple and mis-leading marketing tactic. It is against NYS law for anyone under the age of 18 to purchase vaping products. It’s also against the law to use vaping products in certain areas where minors are present. While this doesn’t make it illegal for a minor to vape, it places vaping in the same regulated category as tobacco. It contains a myriad of chemicals that are being sucked into the lungs and spread to the organs – including the brain – through the blood stream, many of which have not been evaluated for side- and long-term effects. Many people experience a high from ingesting large quantities of nicotine. The “vape buzz” is very common. Vaping devices are sometimes manufactured to resemble USB drives and other small, inconspicuous items. For these reasons FLCS students are prohibited from engaging in vaping or possessing vaping equipment, either on or off campus. First offenses will result in a two-day suspension. Continued offenses can result in expulsion. The Hot Lunch Menu for April is printed below and attached. Boston Field Trip final payments are due this Monday, April 1st. A prayer meeting for the school will be held at school on Monday, April 1st, at 2:10. 3-8 ELA tests begin next month. There is no opting out. All grade-appropriate students will be participating except those with an IEP that specifically exempts them. 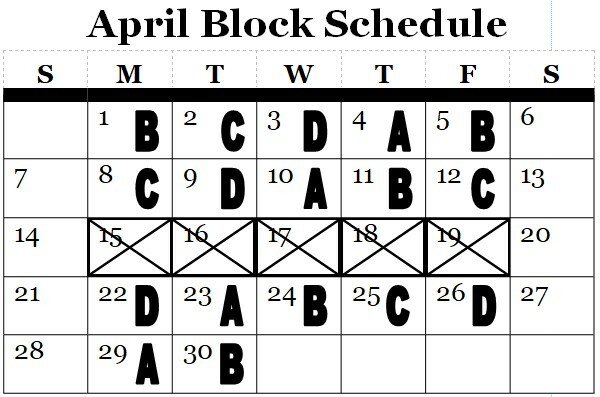 The end of the marking period is Friday, April 5th. Because of Easter vacation and the Boston field trip (which I will be chaperoning) report cards will not be issued until Monday, April 29th. Easter Vacation is April 15th-19th.